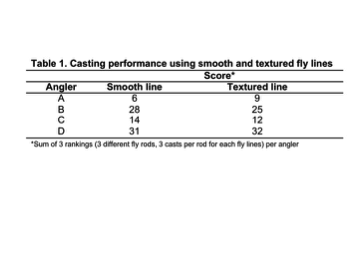 The aim of this study was to determine if the sticker price of a fly rod reflects its ability to make longer casts when used by the average recreational angler. Four recreation fly anglers were recruited to test three rods representing three price points: $70-100 range, $300-400 range and $700-800 range. The data seem to suggest that recreational fly anglers make longer casts with less expensive rods. All test casters were recreational fly anglers who fish with single-handed fly rods anywhere from 10 to 30 days a year. Experience among the anglers varied from one year to as much as 20 years of fly fishing. All participants typically use four to six weight rods when fishing for trout in both lakes and rivers. As none of the casters used the specific equipment before a few minutes were allowed for practicing. When buying a new fly rod recreational anglers are confronted with a myriad of choices. One of main determining factors in their choice often comes down to sticker price. Most recreational anglers tend to buy and use less expensive rods initially, but will often upgrade to more expensive rods later on. One of the main reasons in upgrading to more expensive rods is the enhanced performance offered by higher priced rods, and often this performance is perceived to be extra casting distance. Many recreational anglers think that buying a more expensive rod will help them make longer casts. A comparison of fly rods at three different price points showed, surprisingly, that the lower the price of the rod the longer the casts. 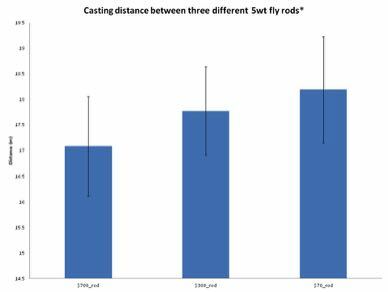 *bar graph of average distance of 4 casters each making three consecutive casts. This study employed recreational anglers that fish anywhere from 10 to 30 days a year, they also fish with fly rods in the $70 and $300 price point brackets. Even though the test-casting subjects never used the exact equipment in the study, it is possible that they are accustomed to the action of the less expensive fly rods. -It is important to note that only one fly rod was used for each price point. It is possible that the outcome is different if five or more different brands are used for each of the price points. -Casting was performed under controlled conditions with no wind using floating lines without weighted flies or strike indicators. Different rod actions using weighted flies, strike indicators and sinking lines may yield different results. -Rod brand names were not hidden from test casters and although anglers were not informed about the purpose of the study it is possible that brand and model recognition could influence how the casters handle the equipment. Does Sticker Price Affect Casting Distance?